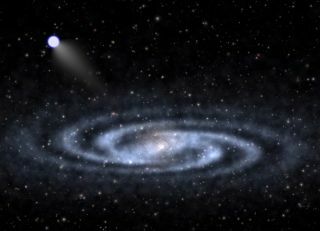 An astrophysicist-artist's conception of a hypervelocity star speeding away from the visible part of a spiral galaxy like our Milky Way. Hypervelocity star 708 is now the fastest-recorded star on its way out of the galaxy, and its origin story is highly unique. The fastest-known star in the Milky Way is on a path out of the galaxy, and new research suggests it was a supernova that gave it the boot. The runaway star, US 708, is traveling at 745 miles per second (1200 km/s) — that's 26 million miles per hour (43 million km/h) —making it the fastest star in the Milky Way ever clocked by astronomers, according to the new research. Its speed will allow it to escape the gravitational pull of the galaxy, and eventually make its way into intergalactic space. A NASA animation shows the hypervelocity star's ejection after a star explosion, kicking off the rogue flight across the Milky Way. Our sun and most of the millions of stars in the Milky Way collectively orbit the center of the galaxy at a mild pace: Our sun travels about 125 miles per second, or 450,000 miles per hour. But there is a class of so-called hypervelocity stars, or HVSs, that are moving with speeds high enough to escape the gravitational pull of the galaxy. Thus far, the fastest of these hypervelocity stars have been clocked at about 2 million miles per hour. But US 708 is moving at more than 26 million miles per hour. "It's significantly faster," said Stephan Geier, a postdoctoral researcher at the European Southern Observatory and co-author on the new research. Geier and some colleagues first identified US 708 in 2005. In the new work, he and his co-authors were able to measure the speed of the star by using both current and archival data, and watching its motion change over a total of about 70 years. The monster black hole at the center of the Milky Way has the gravitational muscle to fling a star on a one-way-track out of the neighborhood, and many other hypervelocity stars are thought to originate from there. But US 708 didn't start its journey near the galactic center, the new research shows. Based on additional clues, the scientists say it was probably orbiting another star when its path changed. US 708 and its partner star were likely orbiting each other very quickly, with a very small distance between them. The neighbor star exploded into a supernova and was completely destroyed. US 708 was suddenly without a gravitational tether to keep it in the same place, and all that rotational speed and energy then abruptly started moving in a straight line. The researchers can't look back in time to see what happened to US 708 before it was set on its current course. But the clues they need are in the star's physical characteristics and current behavior. Speed isn't the only thing that sets US 708 apart from other hypervelocity stars. Before 2014, all detected HVSs were main sequence stars, similar to our sun. Early that year, a group of much larger hypervelocity stars was discovered (those stars also appear to have originated away from the galactic center). But US 708 is not main sequence, and it is not large; it's what's known as a hot subdwarf. As their name suggests, hot subdwarfs are small but have very high temperatures suggesting they were once much more massive. US 708 is currently about half the mass of our sun, but the researchers say it was likely a red giant earlier in its lifetime, with a mass two to three times that of our sun. The red giant's outer layers of hydrogen were probably siphoned off by another nearby star, leaving behind a smaller subdwarf star made mostly of helium. This cannibalizing neighbor star was most likely a white dwarf: a collapsed star that is no longer burning fuel. After it ate the outer layers of hydrogen from US 708, it then began sucking helium away from US 708, which is what eventually led to its demise. As the white dwarf gobbled up more of this material, steadily creating a thick, hot layer on its surface, the helium ignited. Theories suggest that this buildup and ignition of helium then kick-starts the burning of carbon inside the star, which can then trigger the destruction of the entire star, as in a Type 1a supernova explosion. "The white dwarf was completely destroyed," Geier said. Once again, the removal of the white dwarf set US 708 on a path out of the galaxy. The explosion itself most likely contributed very little energy to the star as it left the system, he said. "It's probably one of the most dramatic life stories of a star," Geier said. "The star went through a lot." The researchers can't say for sure if US 708 came from a region where a Type 1a supernova went off. The remnants of such an event would be long gone, Geier said. But the physical characteristics of the star led them to this conclusion: the fact that US 708 is a hot subdwarf made mostly of helium, and the fact that it is rotating very rapidly (this would be a product of its close orbit with the white dwarf). Geier and his colleagues say studying more stars like US 708 could provide information about how Type 1a supernovas form. Scientists use these bright points of light to measure large distances in the universe, so understanding them better can influence many areas of astronomy. Editor's Note: This article was updated to correct the following errors: the speed of US 708 is 745 miles per second (1200 km/s), not 7,456 miles per second. Helium is not considered a highly combustible gas, as was previously stated.